True Grit meets Gran Torino in this blazingly-original crime novel from Anthony Award-winner Bill Crider. A noir thriller with a Western bent, this story of revenge is filled with twists and turns you’ll never see coming. 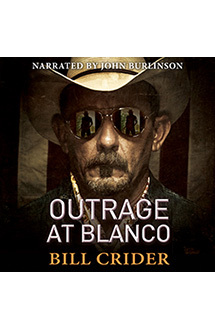 After her heart-wrenching quest for revenge in Bill Crider’s original western crime novel Outrage at Blanco, Ellie Taine dusts off her guns to dish out more justice in this powerful story of vengeance and violence. The piano man has one rule: Don't get involved. Just play the songs. But can he live by that rule when he witnesses a horrific crime? And what price will he pay if he breaks it?